Sometimes it is just cheaper to travel by car with the cost of plane tickets and rental vehicles being as high as they are. It may take you an extra day or two to get to your destination but the savings can really make it worth your while. I will admit that I personally prefer to travel by plane. Sitting in the car is so boring and I could be at my destination in just a few hours on a plane. But the cost of roundtrip tickets to my hometown is over $1,000 for just the three of us! If we fly home we won't have any money left over to actually enjoy our vacation. So we've adopted the road trip style and our bank account has been very thankful because of it. Here are 7 ways to save during a road trip. 1. Plan and book in advance. 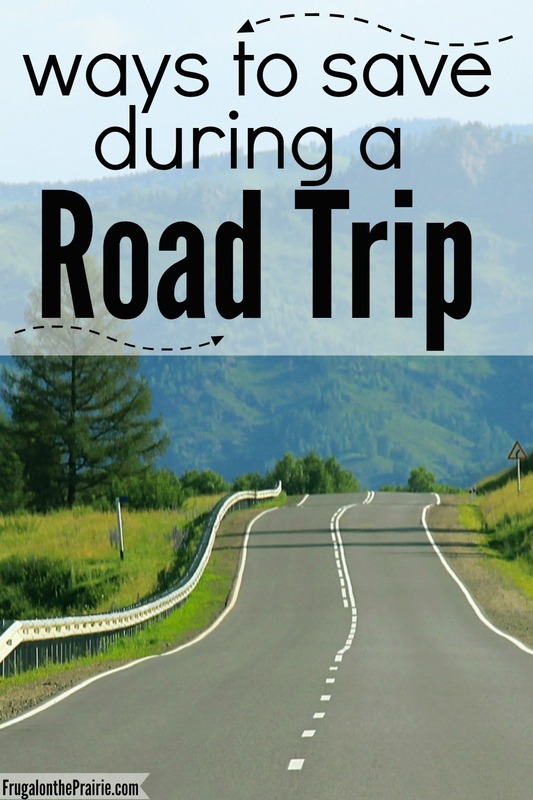 One of the greatest ways to avoid unexpected road trip costs is to plan, plan, plan. If you've found a good deal on a hotel be sure to book it and pay close attention to its cancellation policy. Who wants to pay for a room they unexpectedly don't need? During our last family vacation the baby slept so well in the car that we made it past our original stopping point. We no longer needed the hotel we had already booked but were sure to cancel the room in time and avoid any fees. 2. Sign up for hotel rewards programs. My husband travels a lot for business and one of the perks is that we can use the hotel points he accrues for our own personal vacations. We once stayed in a hotel for 4 nights for free! Signing up for a rewards account typically doesn't cost anything so you really have nothing to lose. And if you're consistent with the hotel brand you stay with, you are sometimes offered extra perks. We're able to take advantage of late check out times, free wi-fi, and free second guest stays with our membership with IHG. The little effort it takes to enroll really adds up! 3. Give your vehicle a little TLC. Make sure you're up to date with the oil change, tire pressure, or anything else that might need a little love. If your vehicle is taken care of, you will find your gas being used more efficiently and the chance of breaking down even lower. No one wants to be stranded on the side of the road! 4. Plan a clear route to your destination. Don't play the guessing game with your travel plans and be sure to map a clear route to your destination. It will cost you more in gas and frustration if you find yourself lost because you weren't 100% sure where you were going. We use the Google Maps app religiously because of it's multiple routes option and heavy traffic warnings. 5. Pack a free lunch and find a free breakfast. It's easy to say "Just bring your own food to save money" but there are specific types that will stay fresher than others while sitting in a cooler. Be sure to pack things like fruits, chips, nuts, granola bars, sliced veggies, and sandwich fixings like peanut butter and bread. To save money on the most important meal of the day look for hotels that offer a free complimentary breakfast. A hearty meal really helps us to get going on the road. We look for hotels that offer hot breakfast items like pancakes and sausage. Danishes are yummy but that sugar will only get you so far! 6. Use an app to save money on gas or food. Take advantage of a free app like GasBuddy to find the cheapest gas prices closest to you. We're huge fans of using the Yelp app to find restaurants within a certain budget. It's a hassle to try to find food around you, check out their prices online, and so on. Using Yelp will help narrow down the closest restaurants by categories (PIZZA! ), features (delivery please), and price (cheap). 7. Don't forget to use your memberships! Do you have a AAA or AARP membership? Do you qualify for military, teacher, or student discounts? We have a Premium membership for AAA just in case something happens to the car while Hubby is on the road. But we also use it to score a few discounts on hotels and restaurants. Most vacations are doomed to be expensive, but with a little planning and care you can actually save a lot of money. Always arrange your hotels, routes, and other important traveling details in advance. And be sure to sign up for any free rewards programs while you're looking at those accommodation options. Don't leave the house without making sure your vehicle can be counted on to get you through your planned route and to your final destination. You'll be dancing when you realize how much money you can save with those packed meals, gas price apps, and AAA memberships. You may even enjoy extra souvenirs and goodies along the way. Happy travels! How do you save money on a road trip?